The teres minor muscle is one of four rotator cuff muscles that surround the shoulder. 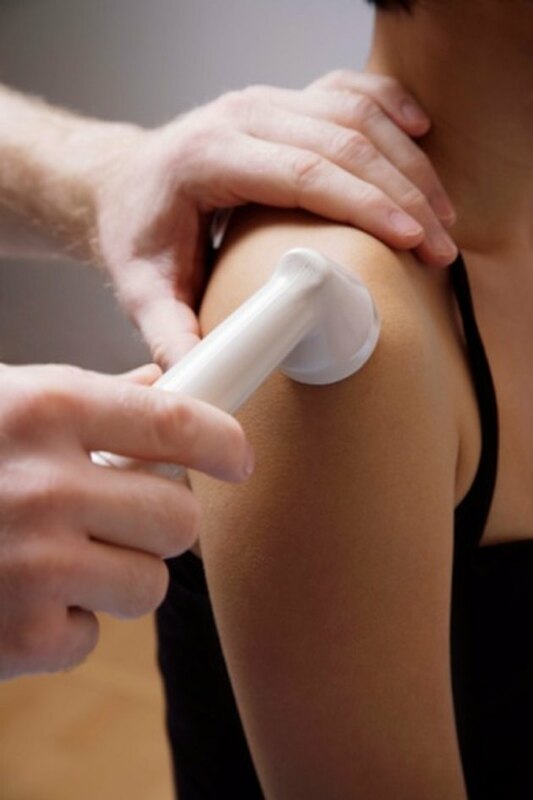 According to the Sports Injury Clinic, the teres muscle helps to externally rotate the shoulder. Injuries to the teres minor can be treated with stretches that help to restore flexibility and reduce pain. The internal rotation stretch works the rotator cuff muscles and specifically focuses on the teres minor. Perform the stretch by laying on your back on a table, bench or bleacher where your arm can hang off. Bend your elbow to a 90-degree angle and make sure that your shoulder and elbow are in straight line. Your palm should be facing down, and a partner can then provide support under the elbow while he pushes down on your fist. Hold the stretch for at least 15 seconds. You can perform the guided arm across stretch standing or sitting. Start by flexing your elbow to a 90-degree angle and making sure your elbow and shoulder are in a straight line. Then, reach your flexed arm across your body towards the opposite shoulder as far as you can. Take your other hand and pull the flexed arm across more to lengthen the stretch. According to DC First Chiropractic Resources, the external rotation of this stretch emphasizes the teres minor. The behind rotator stretch or the posterior shoulder stretch is great for rotator cuff injuries according to the Sports Injury Clinic. This move can be performed standing or kneeling down. Place one arm behind your back with your palm facing behind you and the back of your hand touching the middle of your back. Your elbow should be pointing out, then use your other hand to grab your elbow and pull it forward while keeping your behind the back hand still. The front shoulder stretch works the front muscles of the shoulder area including the rotator cuff muscles. Start by flexing your elbow to 90 degrees and make sure that your elbow and shoulder are in a straight line. Then place your forearm against a wall, door or other solid surface and rotate your body away from the door while keeping the forearm still against the wall. The Sports Injury Clinic advises to hold the stretch for 20 seconds. You should feel a gentle stretch, but no pain, in the front of the shoulder.